We teach German as a foreign language since 1984. Since then many students from all over the world have participated in our courses and many of them have returned several times. 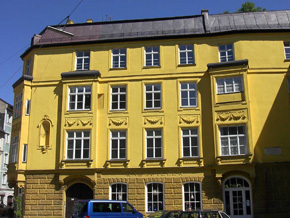 Our language school in Munich is located in the very city center and very well reachable via public transport. Our highly qualified and motivated teachers and the friendly and inviting atmosphere in the modern teaching facilities have provided our language school with an excellent reputation. 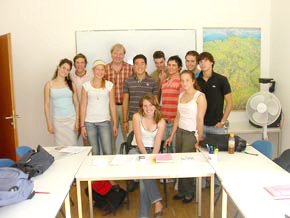 Students from all over the world gather in our class rooms to learn German together. Our library is available to those who would like to continue their studies after class. Our teachers are at your disposal at any time with tips and advise. It is our ambition to offer high quality German language courses to foreigners in a pleasant environment that respects the values of each participant, with the aim of strengthening communication between different linguistic communities in the world. We do not only focus on teaching the German language, but also the German culture and costumes. Our staff and teachers will do their utmost to integrate every student and will always be happy to offer help also beyond teaching hours to make Germany your home away from home! Excellent teaching quality is the most essential asset to a successful school. Due to continuous further training, our qualified and experienced teachers are well acquainted with the latest developments in the area of German as a foreign language. 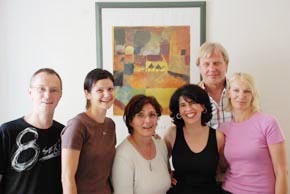 Our instructors are regarded by the students as highly motivated, very competent and knowledgeable friends who not only discuss matters of German language but are also happy to help with advice on other subjects. A lot of times they even organize our extra-curricular activities. All books and teaching materials are provided except dictionaries. You will receive books, a copybook and a pen, a verb wheel as well as all relevant photocopies. Other learning materials like manuals, books, novels and DVDs can be borrowed. At the computer room you have free Internet access as well as WLAN/Wifi Internet access in the entire school. A TV and CD-players are available as well. 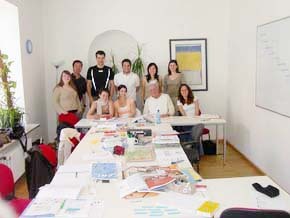 The basis of our courses is the modern usage of the German language. The understanding of, the spoken and the written language as well as the ability to express oneself is to be developed further. The teaching follows a clear structure and is geared towards training grammar and sentence structures and expanding vocabulary. The variety of teaching methods guarantees optimum learning success. Not only will you improve your reading and listening comprehension but also your written and oral expression in individual, partner or group exercises. The most important aspect of learning a language is oral communication and having fun. You can put this into practice in role-playing, language learning games and discussions, as well as during our arranged leisure activities. From the beginning of your first enquiry, up to your booking arrangements until your first day at school you will be in contact with our office team. They will be the ones to welcome you and assist you in any matter related to your stay in Germany until it is time to say goodbye on your last day of school when they hand out your language certificate to you. In our offices we do not only speak German but also English, French, Italian, Spanish, Portuguese and Russian - just in case there is something you would prefer to discuss in a language more familiar to you.